I have die cut these two teddy bears from blue and yellow floral card then mounted them onto gold card. 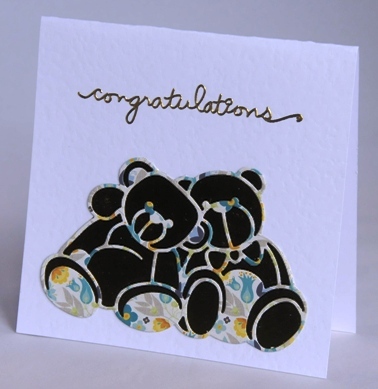 They sit at the foot of this top-fold card underneath the word congratulations which is written in gold lettering. The card is blank inside for your own greetings. If ordering by phone, please reference card #261.